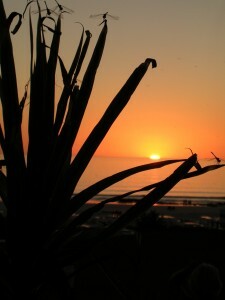 We arrive at Cable Breach, Broome, amid a plague of dragonflies: little harmless orange creatures with cartoon eyes. 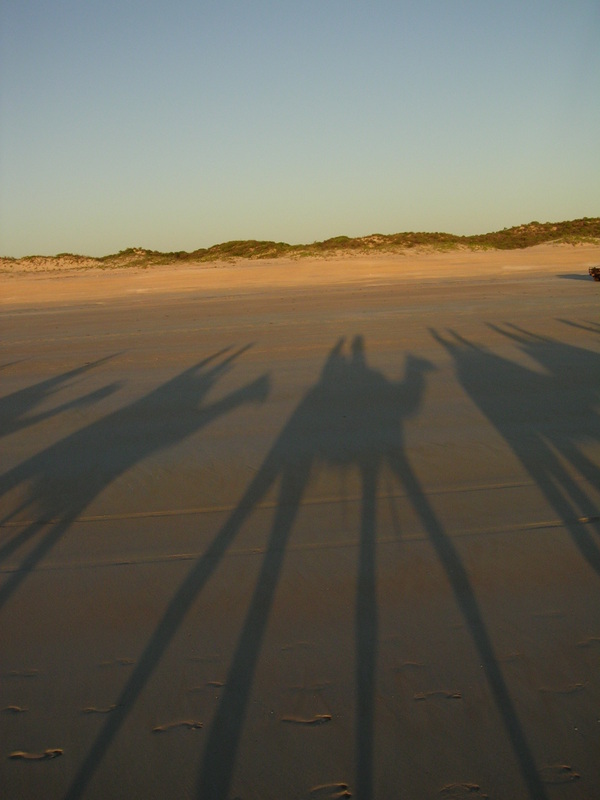 They signify the start of “the dry”, we’re told, and sit on the sand of Cable Beach, heads down, tails up, and hang around until the sun sets over the Indian Ocean. Not that clouds of hovering dragonflies detract in any way from the vista in front of the straightforwardly named “Sunsets” Bar at the Cable Beach Club Resort in Broome,WA. Here, backpackers, German tourists, and 4Wding families onKimberleyexpeditions congregate to watch the sun sink into the ocean and tint the sky livid over a cool drink or two. 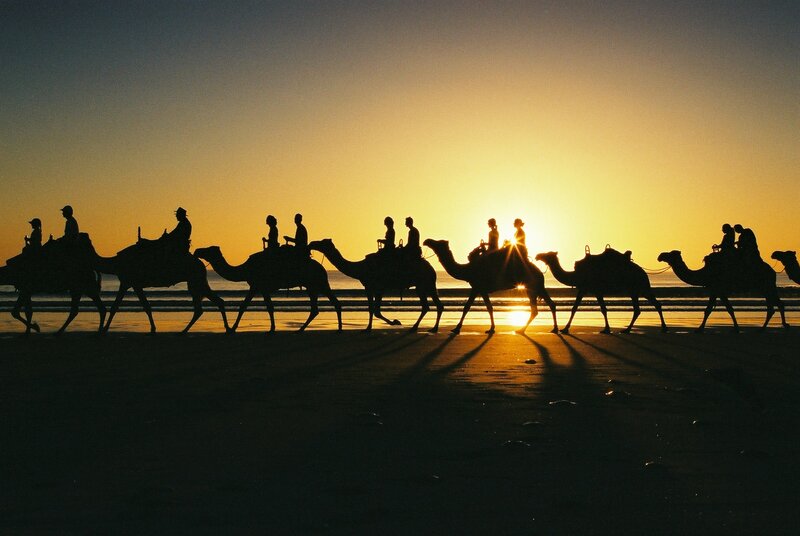 It’s an exquisite sunset scene, also enjoyed with the sloping rhythm of a one-hour camel ride at walking pace ($40) along the beach. 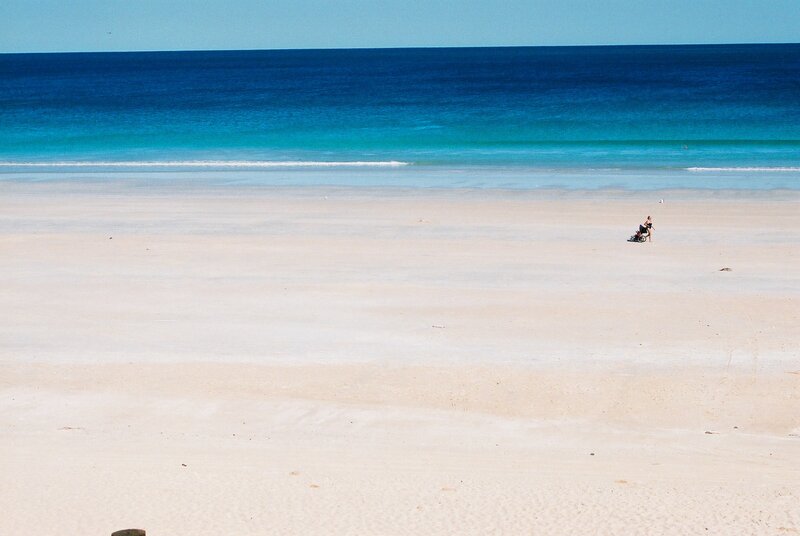 WA’s northern outpost, and a cool gateway to the macho Kimberley region, Broome grew with its pearling industry. With a history that encompasses the salad days of pearling, when all shells were made from mother-of-pearl, to the decline of the same industry and later revitalisation of interest in Australian South Sea pearls, Broome’s character is shaped by the many cultures that came to find their fortunes in pearling: Malay, Chinese, Japanese, and Europeans. 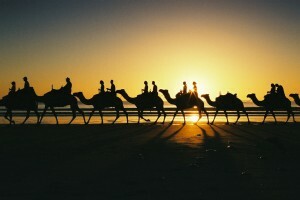 In Broome, Chinatown (the original commercial centre of town) is a sleepy mix of pearl showrooms, galleries and cafés. Sun Pictures on Canarvon Street, Chinatown, is the oldest of its kind in the world, an open-air cinema with deck chairs under the stars playing reasonably recent movies. It’s easy to get distracted by satellites and stars. Inside the cinema, buffs can check out some covetable old movie posters and ancient projectors. 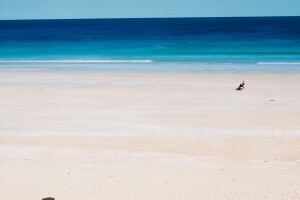 Broome’s Gantheaume Point is worth driving down a dusty red road to scramble over spooky rocks overlooking magic-coloured water, searching for dinosaur footprints. From under the lighthouse, the view of Gantheaume Bay takes in the southern end of Cable Beach, and stretches up past the Cable Beach Club resort in a long white sweep. The Cable Beach Club is an exercise in Mac-luxury for the masses. It’s got all the ingredients: a blessed climate and 26ha of well-bought beachfront location, elegant bungalows and villas, buildings featuring timber walkways and restrained décor in comfy suites, and (of course) west coast sunsets. The gardens are a roll call of the tropics: white frangipani, palms, pandanus, crotons, dracaena, giant water lilies and wax flowers, amid big white gums and figs. And it’sCableBeachitself that’s the star here. Reaching out a wide shoulder of pale sand, the cruisy 22km curve of bay draws you along and slows you down to Broome speed, where all you want to do is sleep under an umbrella, the book beside you abandoned. Built for an English lord, Lord McAlpine, and opened in May 1988, the buildings and gardens of Cable Beach Club house a collection of artwork gathered from the Lord’s travels around the world. At the tail end of a $10 million upgrade, the award-winning resort may boast a fine bone structure, but is in need of a little nudge in the service sector to deserve its international reputation as a quality resort. Although the 260-room resort appears far from fully booked, there is a constant unmet demand for spare lounges around the adults-only Ocean Pool. Beside this pool, the Aveda day spa does a brisk trade. My therapist makes up in bright enthusiasm what she lacks in technique. Our room is well-appointed, but the veranda needs a scrub and the daybed is dusty. Hot water pressure in the shower varies so wildly it approaches dangerous. The message-on-hold on the internal telephone system describes part of the upgrade as “due for completion in June 2003…” A meditation retreat, Buddha’s Sanctuary, is rarely open. Perhaps, as we visit at the end of April, this is just a seasonal resort waking from the stupor of “the wet”. Staff may don a superficial zeal, but tend to lack initiative or even resort knowledge. When we’re told the resort’s Club Restaurant is fully booked, we’re directed to the Asian Affair restaurant on the other side of the complex. This, we discover after a five-minute walk, is closed that night. In this case, however, a happy ending: a brief stroll away from the resort, the Zoo Café (2 Challenor Drive, Cable Beach) offers an excellent menu. Recommended is aKimberleytasting platter ($24 for two), a delightful tourist-focussed novelty featuring kangaroo, emu, barramundi, crocodile and pearl meat with various condiments. The roast rump of lamb ($26) with herb crust is marvelous, a generous portion served on roast vegetables with full-flavoured jus. 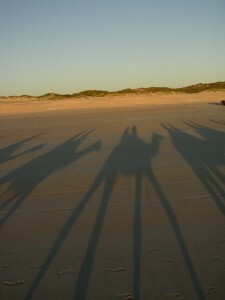 The local pub at Cable Beach, Diggers Tavern, also offers tasty, enormous meals. My partner rates the oysters ($13 a half-dozen) in his all-time top 5. The daunting T-bone steak ($25) served Cajun-style is ably complemented by a chunky fresh guacamole. Back at Cable Beach Club, the lunch menu served by the Ocean Pool is outstanding. Smoked local barramundi on a green paw paw salad ($16) features a zesty chilli ginger dressing and generous paw paw shards, while my partner’s smoked prawns, although a little dry, are accompanied by a fresh and bright udon noodle salad ($17). Looking forKimberleyglamour at Broome’s Cable Beach Club resort, we found comfort and satisfaction in a beautiful setting. And when you’re sitting watching the sun set over the ocean at the edge of a desert, perhaps that’s all you really need, anyway.